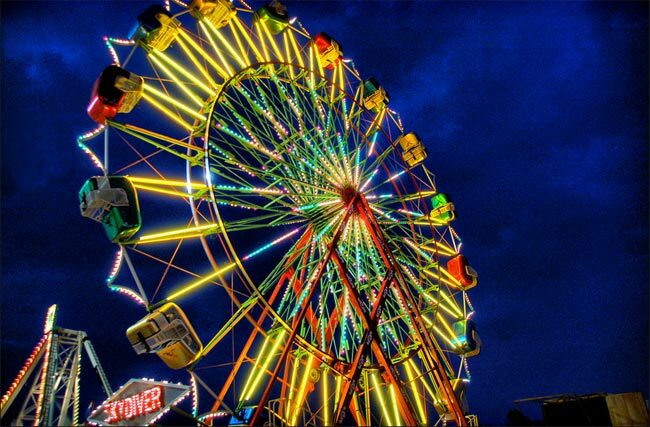 This stunning nighttime shot of a ferris wheel was taken at the Upper South Carolina State Fair in Greenville. Tom enjoys taking photos of the Upstate and beyond and regularly adds them to his blog, Random Connections. Be sure to check it out as it’s one of our favorites. See SCIWAY’s guide to state fairs in South Carolina. Here is their official site with attractions listed https://uppersouthcarolinastatefair.com/attractions. We hope you have a great time! Okay, I’m thinking about going to the State Fair. What kind of rides and attractions do they have this year? Hello Leah, we are not directly affiliated but we did find a phone number online for the fair. We hope this helps! (864)-269-0852. I’m trying to get information about entering home canning into the fair of you could please assist me I would appreciate it. Hello Pam, thanks for reaching out and welcome to South Carolina! We do not have the listings of each and every fair throughout the state and what they allow but we did find the contact information for the Upper SC State Fair which is a great place to start. Here is the number (864)-269-0852. Thanks so much and hope this helps! I have miniature horses do they have any mini shows at any of the country fairs? New to this state and looking for horse show for miniatures. Are you booked for the fair in 2017? I have a young female artist and we are branding her and were wondering what we need to do for her to perform at this event? Are you booking bands for 2017 fair? ok I love this fairrrr. There is a website for the fair above the map. Good luck! I am interested in being a vendor at this fair. Who can I contact regarding costs and an application? Thanks. Hi, Michael. Please refer to the website above the map for someone who can guide you to the fair. Best of luck! Hi, Leroy! There’s a website for the fair located above the map on this page. Hopefully, that will put you in touch with someone connected with the fair. Best of luck! Would like information on becoming a vendor at the 2015 fair. Will you send me a phone number so that I can talk with someone? I would like to know if you rent booth space for travel agents to market? Thank you. I wish you had bingo at the fair. We older people like to play it at the fair. Do y’all have a exhibit hall where vendors can set up? Please reply if you do. I am interested. Thanks. The Upper State Fair is in Pickens County, between Easley and Greenville. It is about a mile from the Greenville County Line. I love the Carolina state fair. I have been going ever since I was 6 years old and it never gets old … I think the folk that have not been should go, it is very cool and they have rides that everyone can enjoy. That’s why you go to the Upper Carolina state fair.